Steve Joined the Abilene Pipers in the Summer of 2009. He is a boot maker at Leddy's Boots in Abilene. Steve's turnons are long walks on the beach and hot chocolate by the fire. His turnoffs are dishonesty and gospel music. 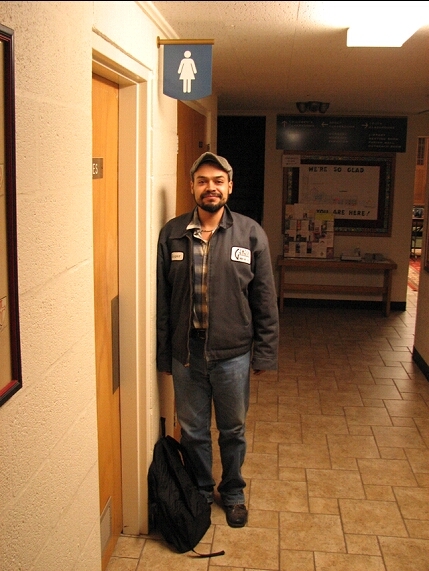 When Steve isn't making custom boots he likes cooking, gardening and vandalism of federal property.pStevie wanted his picture taken under the sign for the women's restroom because he said it looks like him in his kilt. SSteve plays pipes built by Texas Pipemaker, Ray Hughes.y the pipes by watching performances by some of the world's greatest pipers on movies and on TV, along with his strong Scottish family background, but it wasn't until he watched Eric Rigler pipe at Ronald Reagan's funeral that he decided to play. He has performed for local funerals, parades, school sanctioned events, Abilene Art Walk and the 2005 De Leon Peach and Melon Festival.